You are currently browsing the tag archive for the ‘Valentine’s Day’ tag. Valentine’s Day is fast approaching! The reason as to why Valentine’s Day is celebrated on 14 February has been debated by various theories, myths and legends over the years; as to which one is true, who knows?! But we do like the idea that Valentine’s Day, with its notion of romantic love, flourished during the Middle Ages with its tradition of courtly love. Today Valentine’s Day has become a day where lovers express their love for each other through the giving of flowers, the offering of chocolates and the sending of greeting cards – these cards were known as ‘valentines’ in the fifteenth century! Some people believe that this day is increasingly commercial in its emphasis on expensive gifts; rather than giving your Valentine’s store-bought gifts, have you thought about making some simple yet special treats instead this Valentine’s Day? Not only is something homemade an inexpensive gift, but nothing says ‘I love you’ more than when you make something from the heart. 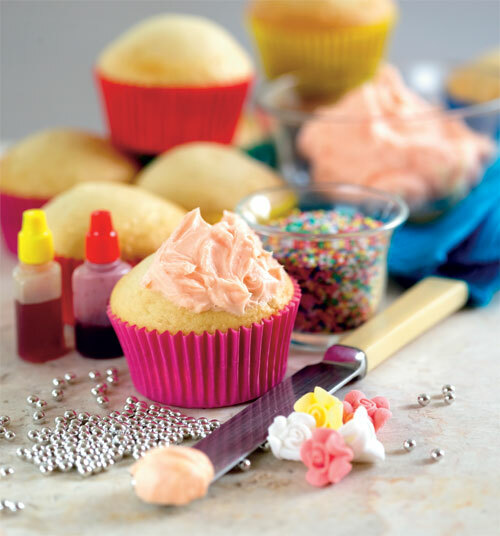 You only need some basic cooking skills to make the cupcakes – see the cupcake recipe on p. 402-403 of The Food Book. Make a batch of butter icing by beating 200 grams of softened butter until light and creamy, adding 6 cups of sifted icing sugar and ½ cup of milk – beat until smooth. Spread or pipe the icing on the cooled cupcakes and decorate with cashous or sprinkles. We prefer keeping the icing plain and using coloured cashous and sprinkles but you may like to tint the icing with a colour or top it with uber-gorgeous Persian fairy floss- now that would make a love statement! You can also pick up some coloured patty pan papers to match your decorations, or decorate your cupcakes by piping a heart shape on each cupcake or the initial of your lover – let your imagination run free! The cupcake will look and taste amazing whatever you choose to do. What ideas do you have for other gifts you could make for Valentine’s Day?